Go ahead, have the extra piece of pie, you're PREGNANT. 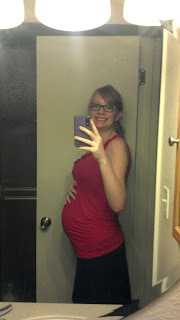 Yes, I'm pregnant, all the more reason to NOT have the extra piece of pie! I'm eating for 2, and that second little person gets no say in what I put into my body. So I need to make sure that its nutritious! This little growing baby eats everything I eat. My first somehow survived on ice cream and taco bell, but this kid is getting the good stuff. Live and learn, right? I consider myself at "normal weight" majority of the time. With my first, I gained 60lbs. I stopped looking when the scale tipped 200lbs. *sigh* I had no self control, and I certainly didn't have a 30lb uterus. So, when I hear someone say "Go ahead, have another slice of pie, you're pregnant!" it drives me crazy. YES, I'm pregnant, so I should STEP AWAY from the pie. I have 2 bodies to care for! I have been the master of self control this pregnancy. Okay, I'm not a master, but I am in the apprenticeship program! I have gained about 4lbs, and I'm nearly 23 weeks. With my first, I had already gained at least 20lbs. Perhaps this is why everyone keeps saying "you look so great this pregnancy" or "you're all belly this time." Maybe last time I was all side chub and belly. (I swear, taco bell addiction is very real) Don't worry, I do indulge, just not daily like I used to. And I'm much more active, and that makes me more alert, and energized! As energized as a pregnant woman taking care of a toddler can be. I think every pregnant woman needs to read this....My first, I gained 65 pounds. And yes I obeyed the "you're eating for two rule." OOPS!! Great post Jesse!! I must be a freak of nature because i am a chubby girl and only gained 7 pounds with my son. He weighed 5 pounds 10 ounces when he was born. I was also on bedrest for my last month. I never thought something like "that" would happen to me. You are doing so great!! First time around we would go out to eat and you wouldn't leave a scrap on your plate, this time around I almost forget your pregnant because you are making such good choices! You are an inspiration to all pregnant women!! Love you and baby girl #2, can't wait to meet her! Those weight gains are not evidence-based, however. Just like birth, each woman's pregnancy is different and normal weight gains are going to be different for each person. The focus should be on what's on your plate, not what's on your scale, kwim? I completely agree! It should say "suggested" weight gain! Every pregnancy is different. And I am not at all concerned with healthy weight gain. My concern is with whats on my plate. ?) Thats what this post is all about! Healthy eating. I will change that to say suggested though. Thanks for the input!